Paramore have announced they will be hitting the road this spring for a month of intimate theater shows. The 17-date outing "Paramore: Writing the Future" includes stops at New York's Beacon Theatre, Grand Ole Opry in Nashville and Los Angeles' Dolby Theatre. 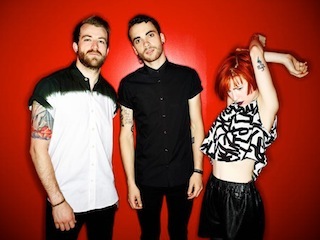 "It feels right to bring the Self-Titled era to a close," said vocalist Hayley Williams in a statement, referring to the band's stunning 2013 album. "We've had a very personal and hugely triumphant journey with this one." "What wouldn't feel right is saying goodbye to this time in the band's career and not celebrating it with our fans in some special way," she continued. "So we've decided to do one last little run with it. Smaller shows, beautiful theaters.... As we acknowledge the past few years (and more) of everything we've been through together, we're also looking forward together at all there is to come." Support comes from Copeland at all non-festival dates. Tickets will go on sale for the tour Monday, Jan. 26 at 9 am for the band's email subscribers, and then to the general public at 10 am on Friday, Jan. 30.